In any gas-powered lawnmower engine, the _ignition coil_—called by some manufacturers the _ignition armature_—is a key element of the ignition system. 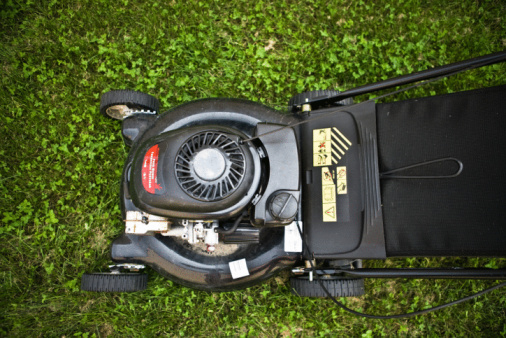 When a lawnmower has been running well but suddenly refuses to start no matter how many times the cord is pulled or the starter is cranked, the ignition coil is a possible cause of the problem. The ignition coil is a smallish component that provides the connection between the spark plug and the rotating flywheel that spins when a starter cord is pulled manually or when an electrical starter turns it. The ignition coil is usually hidden beneath the cover your lawnmower but is clearly visible when you take the motor cover off. Its function is to generate the electrical spark needed to ignite gasoline in the engine. The ignition coil consists of an insulated wire that leads from the tip of the spark plug to a metal armature at the other end, which is mounted to the engine frame near the flywheel. The ignition coil provides the electrical current for ignition on a gas-powered lawnmower. The armature essentially consists of two hidden coils of copper wire that generate electricity when magnets along the outer edge of the flywheel whiz by the coils at high speed. When you pull the cord on a manual start, you are generating the initial electrical current that can jump the gap in the spark plug and start the engine turning. 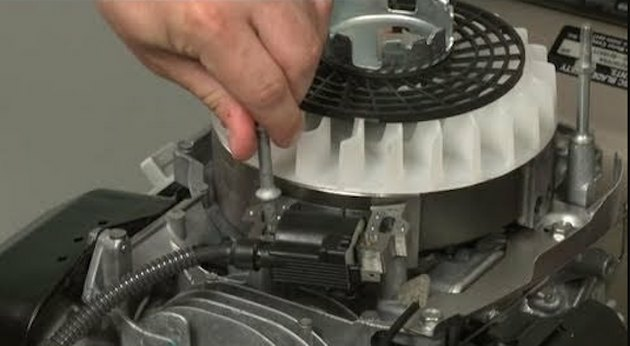 On an electric start motor, a battery-operated starter spins the flywheel. Either way, once the engine is started, the flywheel keeps turning, creating a self-perpetuated ignition cycle. When a lawnmower engine suddenly stops "catching" when you try to try to start it, the ignition coil (along with the spark plug) is the most likely culprit, and it is very easy to test it. 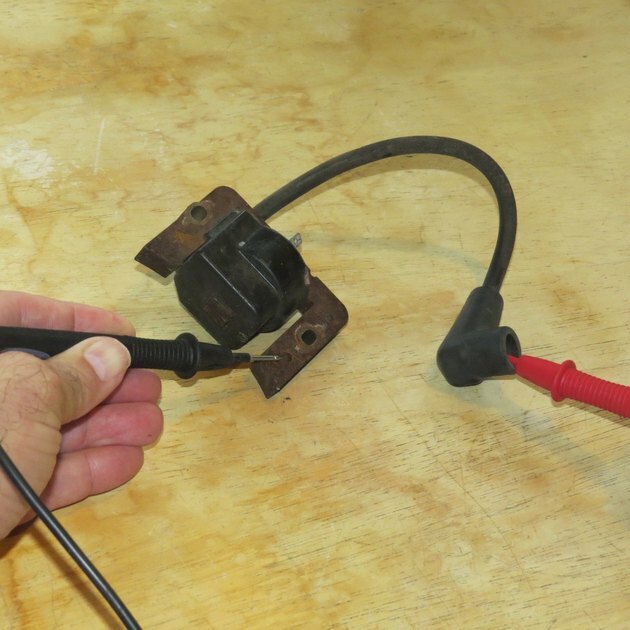 While there are other parts that can cause ignition problems, the following project will show how to test and replace a lawnmower ignition coil. Although accessing and removing the ignition coil may vary from model to model, the process will be similar for all lawnmowers. There are several ways that an ignition coil can be checked, including methods that require you to hold a disconnected spark plug wire against the metal chassis and look for a spark as you crank the engine. Old-timers and very experienced backyard mechanics may swear by this method, but it has some small inherent danger of shock and fire, so our technique involves removing the ignition module and testing it with an ohm meter, a common electrician's tool. This is a completely safe method that will work on any ignition coil. Another diagnostic tool that will work is a multi-meter, if set to measure resistance. If the test described below tells you the ignition coil is bad, it's a simple matter to replace it with a new one by simply reversing the process by which you removed the old one. The key here will be to install the new coil so the gap between the magnets on the coil and the flywheel follow the manufacturer's specifications. A gap that is too wide or too narrow will not allow the ignition system to work properly. However, if you install an OEM (original equipment manufacturer) replacement part, achieving the correct gap should be automatic. If you are buying an aftermarket replacement part, on the other hand, you may need to adjust the gap manually. Remove the cowling (the outer housing) from around the engine, loosening whatever screws or bolts are holding it in place. With many lawnmowers, this will be enough to expose the flywheel and ignition coil; with other mowers, you may need to remove some other shields or parts before you see the coil. It will be the part mounted near the engine flywheel and will have an insulated wire leading to the top of the spark plug mounted in the engine block. An ohm meter or multi-meter is an electrical testing tool that will allow you to check the ignition coil for proper function. Remove the spark plug wire from the spark plug. Loosen the mounting bolts that hold the ignition coil to the engine frame. This will usually mean unscrewing small bolts or screws, or sometimes a pair of set screws. Remove the ignition coil from the bracket or mounting block holding it in place. If the ignition coil has a ground wire, also loosen and remove this at the point it attaches to the lawnmower chassis. Touch the red lead on the ohm meter to the spark plug connection and touch the black lead to the armature on the ignition coil. Lay the ignition coil on a work surface. 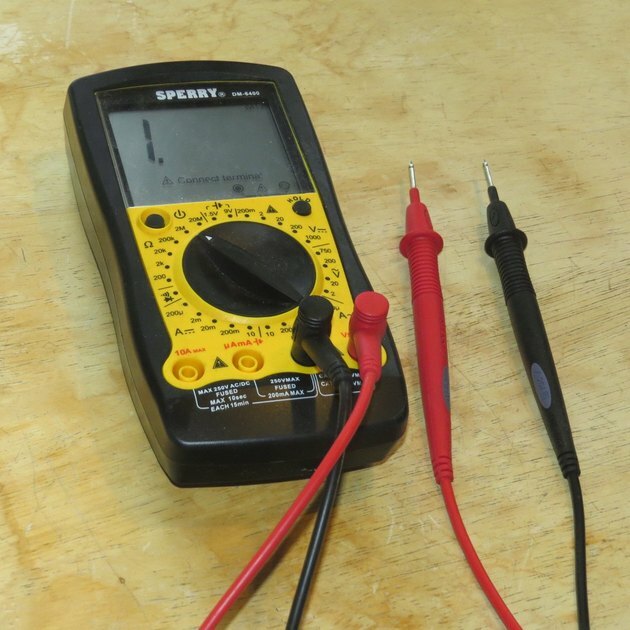 Set the dial on an ohm meter or multi-meter to 20k ohms. Insert the positive lead on the ohm meter into the end socket or the metal hoop on the spark plug wire. Put the negative lead of the tester onto the metal armature portion of the ignition coil. As you watch the meter display, scratch both leads around to make sure you are making good metal-to-metal contact. A reading of "1" indicates complete resistance, or no connectivity. This indicates an ignition coil that has failed. Look at the reading on the ohm meter. Ideally, you should see a read-out of 2.5k to 5k ohms, indicating that the coil's wiring is intact and working correctly. 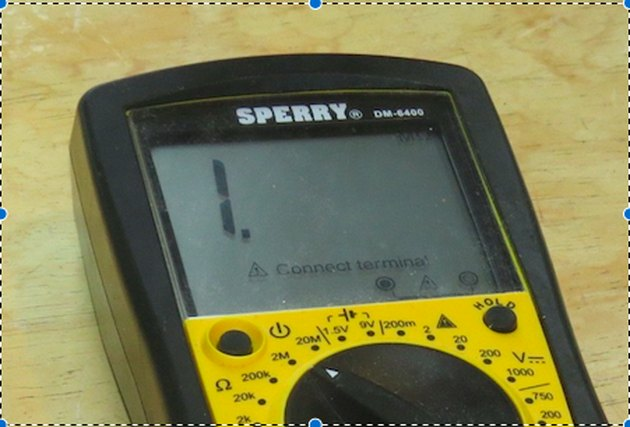 (On an ohm meter, a reading of "0" indicates no resistance at all [perfect connectivity], while a reading of "1" indicates complete resistance, or no connectivity.) If you test the coil and the meter remains at "1" it means there's no connectivity and that coil is faulty and needs to be replaced. If the ignition coil is faulty, buy a new one that is specified for use on your mower engine. The best way to ensure this is by taking the old module to a small engine parts dealer and asking the clerk to match it. If you are buying online, shop for an ignition coil that is specified for your model of lawn mower. When installing the ignition coil, attach the ground wire (if there is one) first, then the armature end, following the manufacturer's recommendation for the proper gap between the armature and the magnets on the lawnmower flywheel. Some service technicians use a thin piece of cardboard, such as matchbook cover, to establish this gap, but a spark plug gapping tool will also work. Tighten down the armature tightly to the engine frame. Finally, reattach the spark plug wire over the end of the spark plug. Test the engine to see if it starts and runs correctly.